The entire operation in a single workflow! Savings of up to 50% on normal hours spent on a number of workshop tasks – does that sound too good to be true? QuickTube is the Skovsager Group’s experienced specialist in conventional laser tube cutting as well as in advanced 3D laser tube cutting. 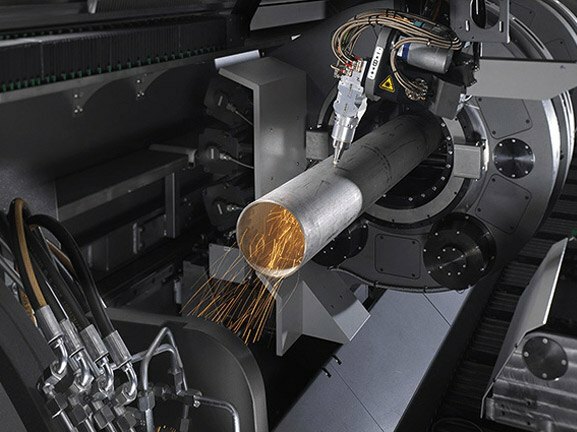 3D laser tube cutting achieves unique uniformity and precision, to provide an efficient manufacturing flow in the finish work – generating great savings in your own production process. QuickTube knows that 3D laser tube cutting is the way to work with steel and aluminium, going forward. Using the latest 3D laser-cutting technology, we make, in one operation, a number of cost-increasing operations unnecessary, such as drilling, sawing, milling, chamfering and punching. Thanks to our recent investment in one of the largest laser cutters in northern Europe, we are now able to offer customers utterly unique options that transcend what used to be the bounds of dimensioning when it comes to 3D laser tube cutting. We are able to cut the large workpieces for your project at our own factory, and then ship them to the construction sites, where the tailor-made elements can be readily assembled according to your particular requirements. That saves you valuable time on various adaptations of tubes and profiles on the construction site and in the welding booth. The sooner you involve us in your project, the more your architects, clients and contractors will be able to benefit from our expertise and experience, working with us to identify the very best solution. Our new laser cutter is a fibre laser cutting machine, so it is also suitable for cutting copper and brass. With the array of machinery now at our disposal, therefore, the possibilities are virtually infinite. When we deliver the parts for large frames and structures, we can draw on years of experience building user-friendliness and efficiency into the project. We engrave ID numbers on the individual parts, making assembly straightforward for the welders. Dovetail solutions ensure robust, efficient assembly of sheet and tube components, sometimes supported by engraved instructions. It doesn’t get easier than that! QuickTube A/S delivers in accordance with EN1090-1 with the associated traceability and documentation. We are also have certification in ISO 9001:2015. Please contact us if you would like a guided tour and demonstration of the possibilities for your project. Laser cutting guarantees you a 100% identical result every time. This minimises the risk of cutting errors and resultant assembly errors, facilitating post-processing and resulting in a more attractive end-product that you can take pride in delivering to your customers. You always get precision corners and edges, making assembly of the machined workpieces a really straightforward task. We are one of the very few companies in Denmark with the facility to connect a catcher, ensuring that the machined tubes are entirely free of laser spatter, needing no further processing once they have left our production halls. 3D laser tube cutting opens up untold possibilities for innovative thinking, and solutions that would not be possible using 2D laser cutting and the usual methods. Get in touch with us to find out more about the options available with 3D laser tube cutting. There’s always hot coffee in the pot. Prepare to be amazed at the price as well as the quality! We’d also love to come to you to show you a selection of machined workpieces. Sawing, milling, drilling, punching, engraving … three-dimensional laser tube cutting instantly eliminates all these operations that add to the cost. The process saves an enormous amount of time because there is no need for multiple set-ups, and the process is reliable because the precision is unsurpassed. For example, we can engrave ID numbers or certificates and charge-numbers onto the workpieces when we have them in the machine, or create assembly diagrams for large structures. You can also have us deliver your complete kit set, packed and sorted in accordance with your instructions and delivered with dovetail solutions or assembly engravings for rapid post-processing. It doesn’t get easier than that! We are keen to help you all the way from concept through to production. Our experienced designers are always able to assist with prototypes, designs or 3D/2D mapping of your own inventions. Laser tube cutting reduces throughput time and production costs by bringing together multiple operations in a single process. However, that doesn’t mean we spend the time we’ve saved resting on our laurels. On the contrary, we chose to introduce round-the-clock production. That means we are able to offer our customers a highly efficient manufacturing flow and short production times. We are still constantly amazed at the possibilities of laser cutting, and we rarely say no to a challenge. You could almost say identifying new areas of applications has become something of a sport. Machining workpieces at angles of up to 45⁰ with an accuracy of up to 0.1 mm and with minimal heat applied, the possibilities are virtually untold.